Tonight we celebrate the Nativity of our Lord. “The Word was made flesh and dwelt among us.” The Incarnation is the great mystery that reveals God’s wonderful love for mankind. In this sermon from the Parochial and Plain Sermons Newman draws from texts throughout the Scriptures to describe Jesus the Son of God, foretold in the prophets and revealed in the flesh. He begins commenting a passage from the Letter to the Hebrews: “Both He that sanctifieth and they who are sanctified are all of one: for which cause He is not ashamed to call them brethren.” Heb. ii. 11. 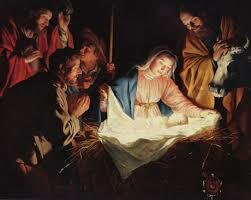 As He was born, so are we born also; and since He was born, therefore we too are born. As He is the Son of God by nature, so are we sons of God by grace; and it is He who has made us such. This is what the text says; He is the “Sanctifier,” we the “sanctified.” Moreover, He and we, says the text, “are all of one.” God sanctifies the Angels, but there the Creator and the creature are not of one. But the Son of God and we are of one; He has become “the firstborn of every creature;” He has taken our nature, and in and through it He sanctifies us. He is our brother by virtue of His incarnation, and, as the text says, “He is not ashamed to call us brethren;” and, having sanctified our nature in Himself, He communicates it to us. He came in that very nature of Adam, in order to communicate to us that nature as it is in His Person, that “our sinful bodies might be made clean by His Body, and our souls washed through His most precious Blood;” to make us partakers of the Divine nature; to sow the seed of eternal life in our hearts; and to raise us from “the corruption that is in the world through lust,” to that immaculate purity and that fulness of grace which is in Him. Let us at this season approach Him with awe and love, in whom resides all perfection, and from whom we are allowed to gain it. Let us come to the Sanctifier to be sanctified. Let us come to Him to learn our duty, and to receive grace to do it. At other seasons of the year we are reminded of watching, toiling, struggling, and suffering; but at this season we are reminded simply of God’s gifts towards us sinners. “Not by works of righteousness which we have done, but according to His mercy He saved us.” We are reminded that we can do nothing, and that God does everything. This is especially the season of grace. We come to see and to experience God’s mercies.